There in the illimitable, countless millions of years ago, occurred one of those stupendous explosive births that rearrange the destinies of the suns. One of the smaller suns, a white-hot incandescent chaos, with its surface flowing away in vast streamers and tails, burst under the antagonism of its elements, and hurled upon darkness its broad sheets of flame. Fisher has a way with words. Okay, it's a pretty clunky way with words, but it is vivid and it's all his. From there we get the evolution of life on Earth, from single-celled organisms through prehistoric humans and with it the Vardis Fisher take on how life is. Creatures evolve until they get too comfortable and then they're taken down. It's the strivers that win out in the end; ease of life brings down everything from undersea predators to dinosaurs. "Nature," in Fisher's words, "eventually levels to the graveyard those beasts whose might makes them secure from all enemies. For in struggle alone is there the will to survive." As it is with beasts, so it is with humans. Most of Darkness concerns the adventures of Wuh, a prehistoric man living on the fringes of a small group ruled by the mighty but lazy Ho-wha. Ho-wha scares off the predators and he gets all the women. He's bigger than Wuh but not as clever. Or as horny. Driven by lust, Wuh eventually outwits Ho-wha, taking advantage of Ho-wha's son's discontent and using his newfound ability to use projectiles as a weapon, he absconds with Murah, one of Ho-wha's women. After previously having to content himself with masturbating in the proximity of sleeping women, Wuh finally gets some. From there, Wuh forms a little tribe of his own and is able to pass on some of his innovations to those who follow him. Throwing stuff, it turns out, is a pretty valuable addition to the human repertoire. Progress forever comes from violence and discontent. If Wuh weren't so horny and unsatisfied all the time, or so willing to use violence, humanity would never have build the pyramids. Or at least that's the endlessly reinforced logic of this book. Fisher's no great prose stylist and the tone here is didactic to a fault. He tells readers how life works as often as he illustrates it. He also establishes early on his vision of the world then keeps circling back and repeating himself without refining what he's saying. But there's a forcefulness to his vision that's tough to deny, especially if your tolerance for books with characters named "Ka-ka" and "Gah" is relatively high. 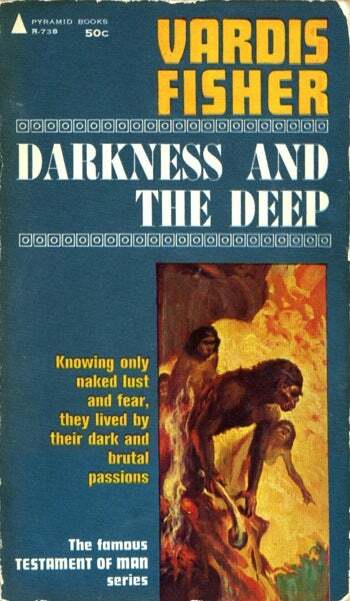 Fisher's completely uncompromising and unsentimental in presenting a world unthinkable before Darwin and Freud, a vision of humanity driven primarily by sexual hunger and the instinct to survive. And every once in a while there's a weird kind of poetry to his writing, as when Wuh witnesses a python devouring a deer and we see the first stirrings of human empathy. The serpent saw Wuh but it did not stir. Fascinated, chilled by horror, and emotionally so overcome that he began to sweat and urinate, Wuh stared at the spectacle. Because he was a neurotic man with some power of projecting himself into situations of struggle and pain, he felt both sickened and enraged. First comes involuntary urination, then sweat, then philosophy.